Leslie McDevitt – Control unleashed! Leslie McDevitt is a certified dog behavior consultant, internationally renowned speaker and author of three books, Control Unleashed: Creating a Focused and Confident Dog, Control Unleashed: Puppy Program and one coming out for this winter US Time – Control Unleashed: Reactive to Relaxed. Leslie’s writing has been translated into various languages including Russian, Czech, German, Norwegian and Swedish. She is on the 2019 Clicker Expo Faculty and will also be joining the Fenzi Dog Sports Academy Faculty. 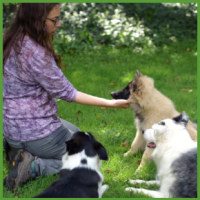 Leslie has twenty years’ experience using clicker training to build confidence and help companion, working and performance dogs feel comfortable and happy with challenging environments. 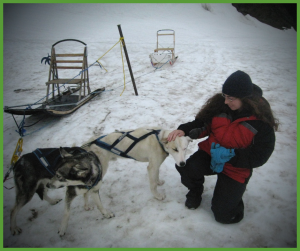 She also consults for the University of Pennsylvania Working Dog Centre where she works with dogs in training to be a K9 patrol, scent detection, and SAR dogs, again helping them learn to process the stimuli in challenging work environments so that they can focus on their job. Leslie’s first and most influential teacher was Dr. Karen Overall, and she is strongly influenced by her concepts of biofeedback training and her Relaxation Protocol. In Leslie’s work, you can see the confluence of Dr. Overall’s relaxation protocol and using clicker training to create counter conditioning procedures with an operant base. Leslie says the thing that gets her most excited at the moment is using start button behaviors she borrowed from animal husbandry training in order to empower dogs to direct their own counter conditioning procedures.